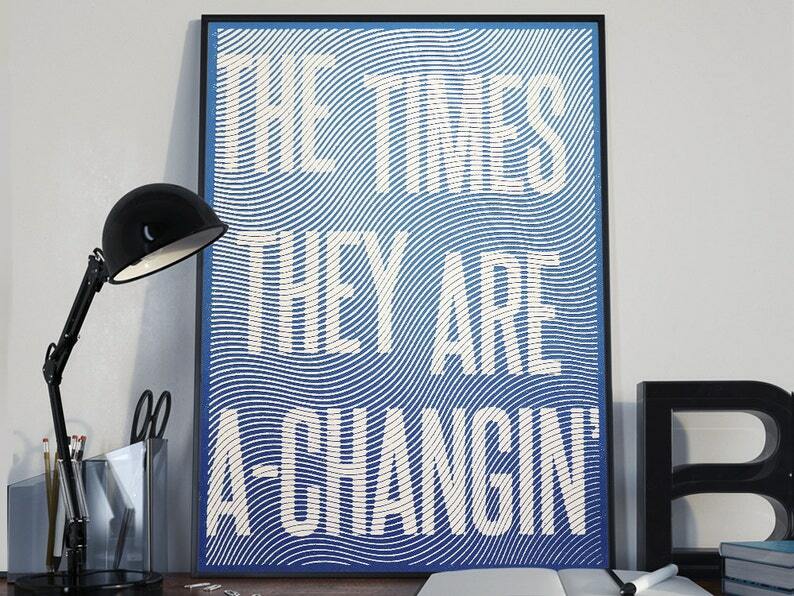 This screen printed Bob Dylan poster was created in homage to his masterpiece, The Times They Are A-Changin'. The hand drawn typography, flowing design, and halftone patterns represent the brilliance of Bob Dylan's lyrics and the song's message of change, which is always relevant. Whether young or old, we can all appreciate one of the most iconic songs of 60s rock, especially with a nifty poster. PAPER & PRINTING: This poster is screen printed in 2 colors on French Construction White Paper. SHIPPING: All posters are carefully shipped in sturdy cardboard tubes. This poster was designed by Thomas Bloch, a graphic designer who lives and works in New York City. Printing was done by Toto Print Co. in Highland, NY.